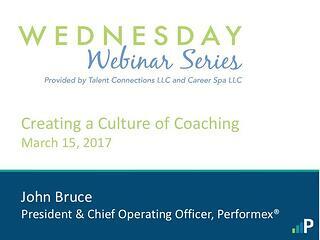 On March 15th, our President and COO, John Bruce, led a webinar, “Creating a Culture of Coaching.” This was John’s third time presenting in the Wednesday Webinar series – a complimentary program offered by Talent Connections and Career Spa. 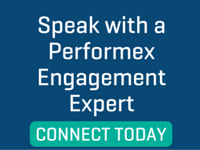 The session was held from 12:00 – 1:00 PM EST and is approved for one SHRM Professional Development Credit. A Culture of Coaching is an organization where coaching - both for development and for performance improvement - is an essential part of the company's DNA. This foundation enables superior business results, a vibrant learning environment, and high levels of engagement.